Description: The flowers are small, petal-less, and have 3 to 6 (typically 4) green, lanceolate sepals. 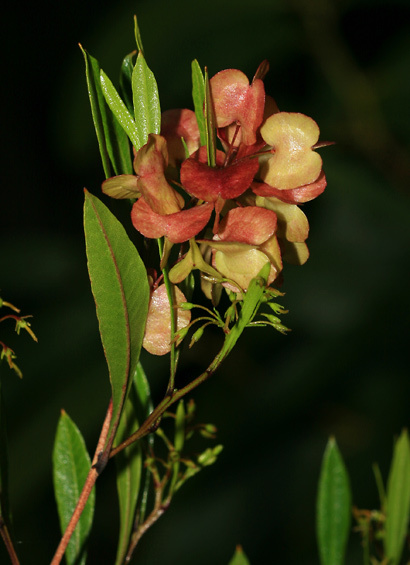 The inconspicuous flowers are followed by showy, flower-like clusters of green to yellowish ripening to pink, red, or maroon seed capsules with 3 or 4 membranous wings. The seed capsules eventually dry to a papery brown. The leaves are shiny, dark green to tinged reddish purple, hairless, alternate, and oblanceolate, lanceolate, or narrowly oblong in shape with a tiny, purplish red, pointed tip. The leaves sometimes have a sticky, varnish-like, resinous coating and can have either smooth or undulating margins. The plants are well-branched, and the bark is reddish brown to blackish gray in color. 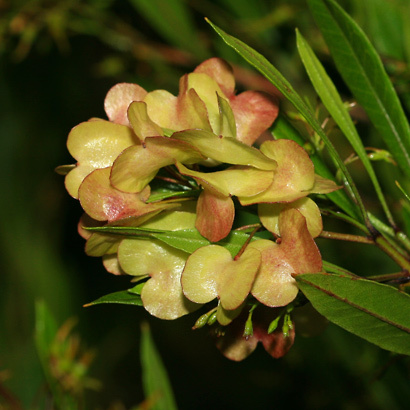 Here in Hawaii, Florida Hopbush grows in sunny, open areas from low to high elevations. These variable plants are early colonizers of lava flows. 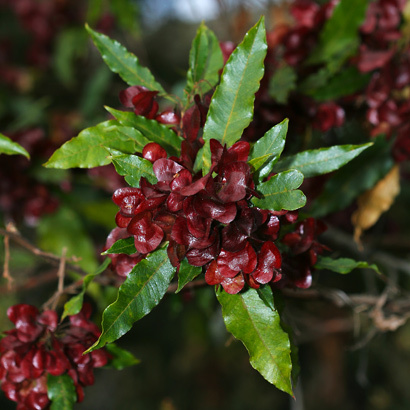 Hawaiians used the plants for medicinal purposes and the colorful seed capsules were used in leis. 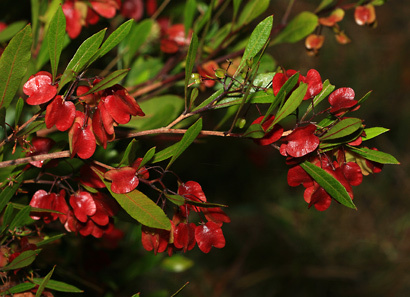 Poisonous – The plants contain soapy saponin and are poisonous.